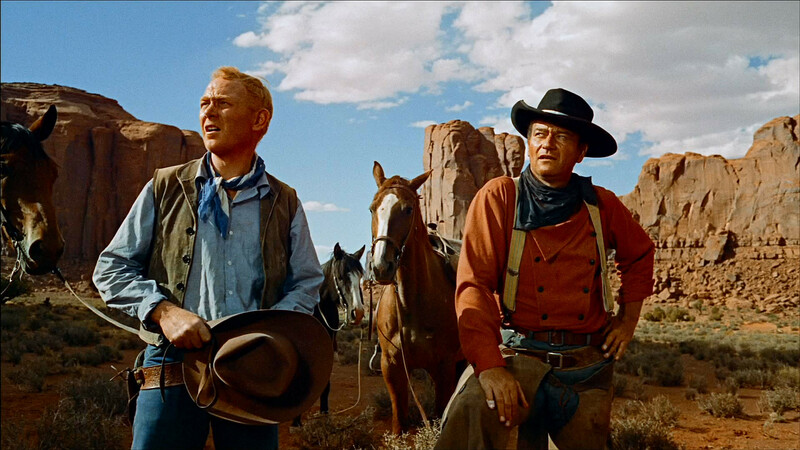 Over a period of eight years, director Howard Hawks filmed virtually the same story twice—both films starring John Wayne—with the only differences being some minor script changes and a different set of supporting actors. The films were Rio Bravo (1959) and El Dorado (1967). Interestingly, both films hold up pretty well today. 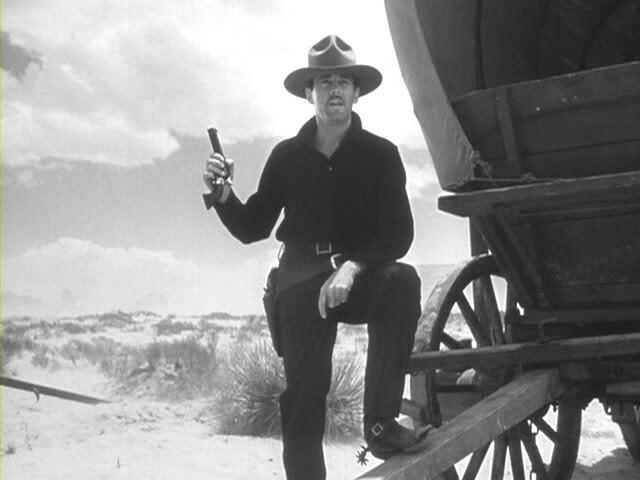 Both films were a reaction to Fred Zinnemann’s High Noon (1952), in which Sheriff Gary Cooper tries and fails to enlist the help of his fellow townspeople in fending off an attack of several bad guys seeking vengeance for having jailed several of them. 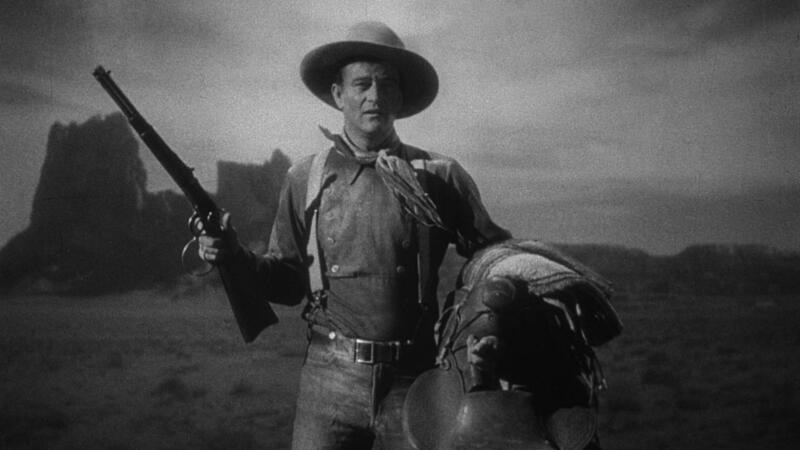 In contrast, John Wayne turns away several offers of help in the Hawks pictures and beats the bad guys anyway. Both times, the sheriff is under attack by wealthy ranchers who bring in hired guns to assist them. 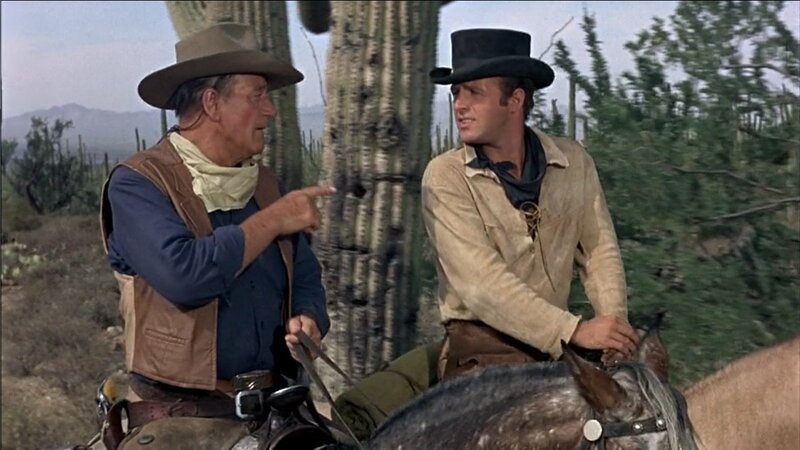 John Wayne plays himself in both pictures, though in El Dorado, he is a gunfighter assisting his friend, the sheriff, played by Robert Mitchum. Dean Martin plays the drunk lawman in Rio Bravo; Robert Mitchum, in El Dorado. 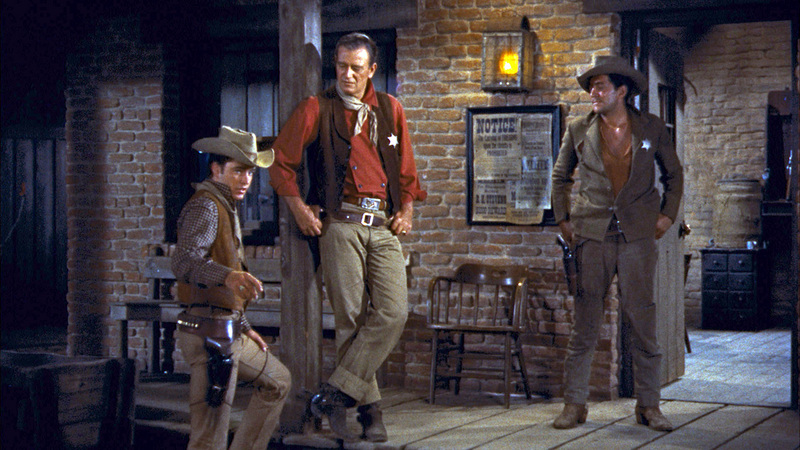 The young gun is played, respectively, by Ricky Nelson and James Caan, in his first major role. The female lead is played, respectively, by Angie Dickinson and Charlene Holt. 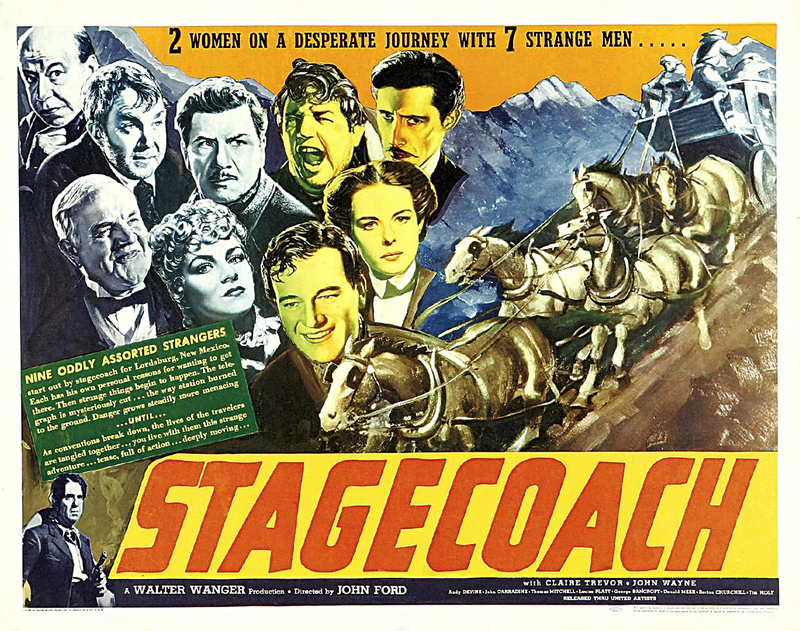 The deputy comic sidekick is played, respectively, by Walter Brennan and Arthur Hunnicutt. I just saw Rio Bravo again for the nth time yesterday afternoon. I will summarize it here because it is fresh in my memory. John Wayne and Dean Martin arrest Claude Akins for shooting an unarmed man. Unfortunately, scapegrace though he is, he is the brother of powerful rancher John Russell, who is determined to spring him before the U.S. marshal comes to town in six days. He besieges the jailhouse with his men and orders the musicians in his saloon to play El Deguëllo nonstop. This was a bugle call played by Santa Anna’s Mexican troops during the 1836 siege of the Alamo. Eventually, Russell’s men manage to kidnap Dean Martin. Wayne arranges for an exchange of Martin for Akins at a warehouse at the edge of town. The good guys prevail. There is a third Howard Hawks film with a similar story, Rio Lobo (1970), which was the director’s last film. Although I love Hawks’s works, this is one you can skip. Film is an art form that involves the work of teams of people: producers, directors, writers, crew, and actors. As a result, virtually no film is perfect. That is particularly the case when directors like Sam Peckinpah are at odds with studio heads like MGM’s James Aubrey. Aubrey didn’t give Peckinpah anywhere near the resources he requested, partly because his attention was turned to completing the MGM Grand Hotel in Las Vegas. 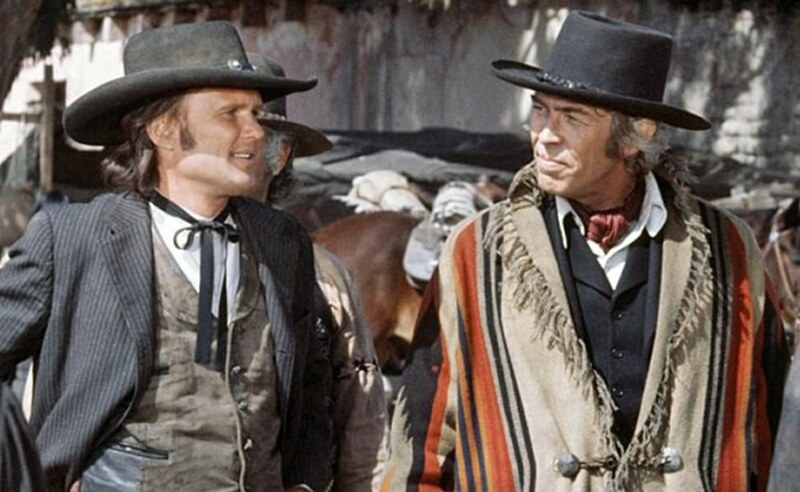 And yet Pat Garrett and Billy the Kid (PG&BK) is a wonderful film. It is certainly a violent one: Martine left the theater at the Autry Center about a half hour into the film. There is a lot of swearing, a number of characters die bloody deaths; and yet … there are scenes of such beauty that one rarely encounters. I am thinking particularly when Slim Pickens as Sheriff Baker is gut-shot, and his wife, played by the splendid Katy Jurado, throws away her rifle and follows him to the side of a pond where he has gone to die. In the background, the lovely song “Knockin’ on Heaven’s Door” is playing. PG&BK plays with the whole Billy the Kid legend. James Coburn as Pat Garrett is the unwitting tool of the Santa Fe politicians, led by General Lew Wallace, author of the novel Ben Hur. In the past, Billy the Kid (Kris Kristofferson) had been a lawman, and Pat Garrett the outlaw. Now the roles have been reversed. 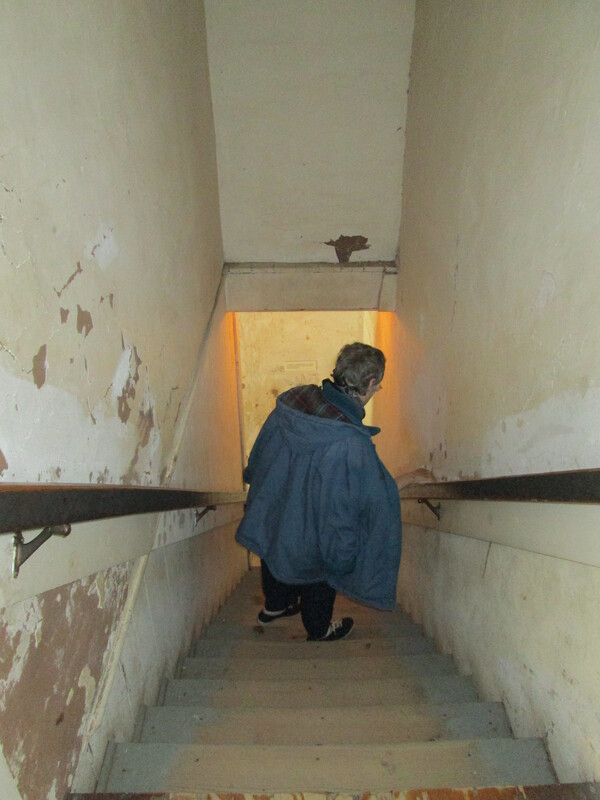 In June, Martine and I visited the town of Lincoln, New Mexico. Pat Garrett was the sheriff of Lincoln County. Peckinpah did a wonderful job of recreating the courthouse room where Billy was held prisoner and guarded by deputies J. W. Bell and Bob Olinger, both of whom were shot during his escape. In the photo above, Martine is obscuring with her left shoulder a bullet hole which Billy may have created when he shot his way out of captivity. There is a strange quality to PG&BK. It seems as if Billy and Pat spend most of the film avoiding each other. 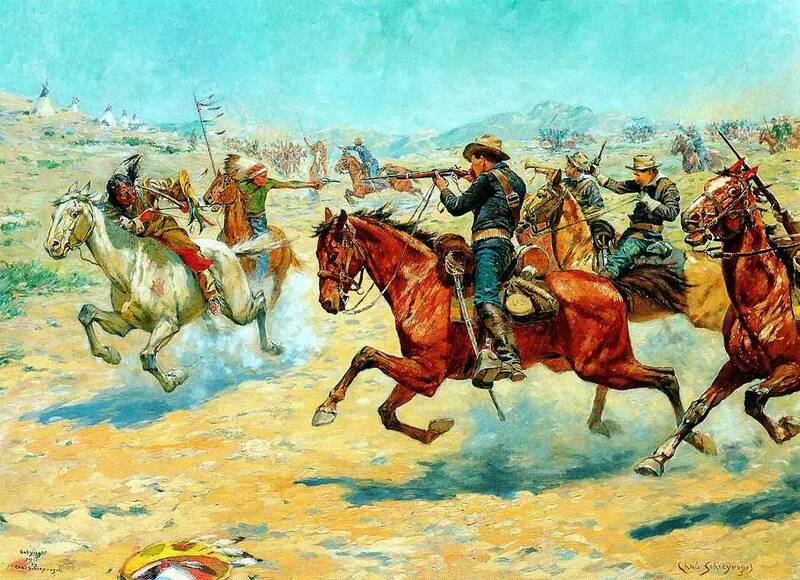 Only at the end does Pat seem to feel pushed to catch up with his old pal Billy at Fort Sumner and kill him. Even there, there is a certain delicacy on his part as he waits for Billy to finish making love to Maria (played by Kristofferson’s wife, Rita Coolidge) before making his presence known and killing him. 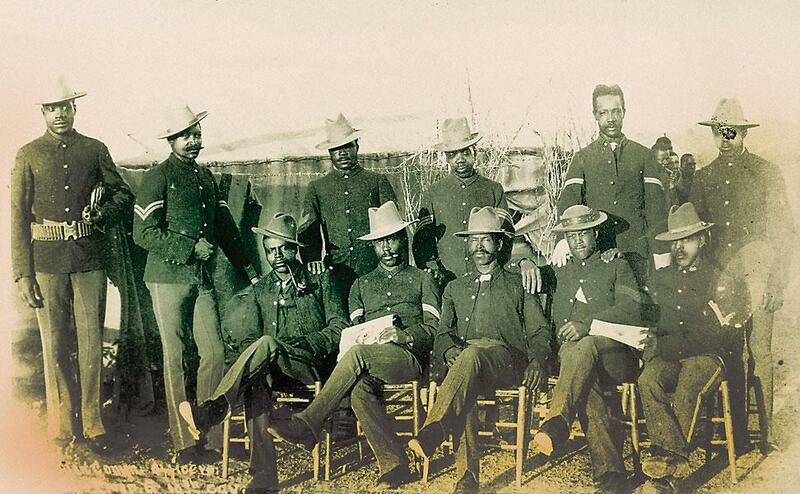 The Indians we know most about are the ones that appeared in the old Westerns: The Navajo, Apaches, Comanches, and Sioux. There are some twenty Indian tribes in New Mexico and Arizona that, insofar as I know, never appeared in any. John Wayne never fought them, nor did Randolph Scott or Jimmy Stewart or Audie Murphy. I am referring to the Pueblo Indians, most of which are located around Albuquerque and Santa Fe, New Mexico. 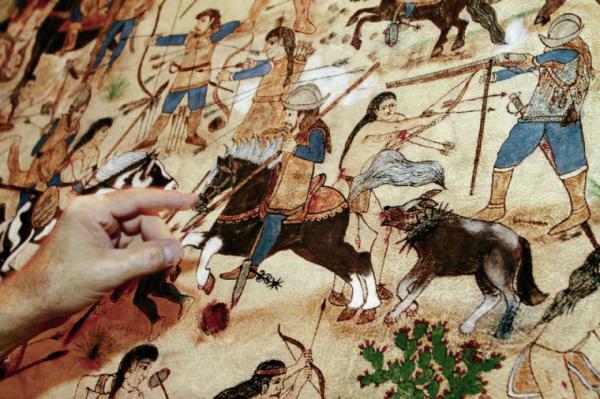 We know that the Navajo, Apaches, Comanches, and Sioux have been warlike. But did you know that the only successful Indian revolt against Western colonization was fought by an alliance of Pueblos in 1680. It was not until twelve years later that the Spanish reconquered the territory, but even then with difficulty. 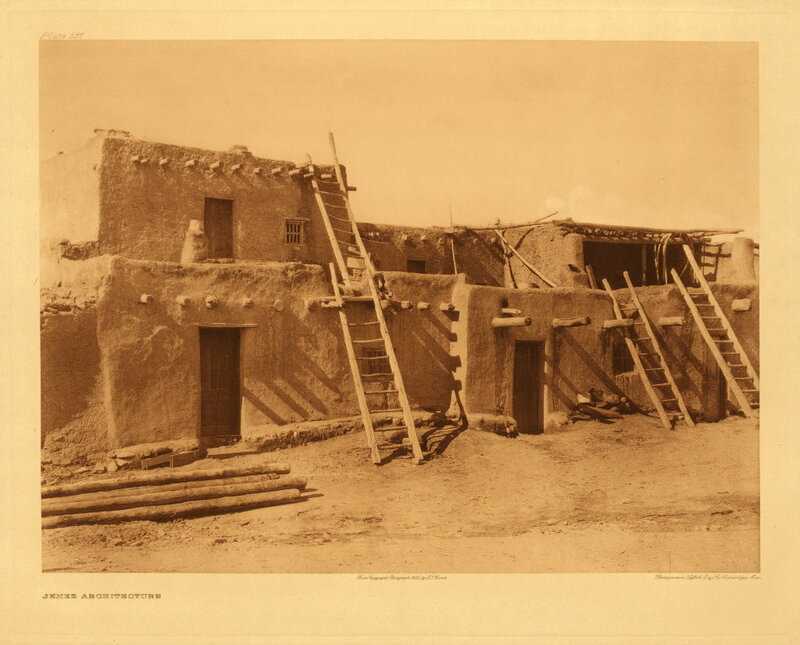 Many of the most warlike Pueblos simply united with the Hopis and Navajos. I have just finished reading The Pueblo Revolt: The Secret Rebellion That Drove the Spaniards Out of the Southwest by David Roberts (New York: Simon & Schuster, 2004). The key word in the title is “secret.” To this day, the Pueblos do not choose to discuss the conflict—even one that occurred over four centuries ago. Consequently, most people do not know about it. Why the secrecy? I think it is a cultural trait. Years ago, Martine and I spent the night on the Zuñi Reservation at a time when most of the town and surrounding areas were off limits to non-Zuñis because some tourist had misbehaved at a ceremonial in the distant past. One cannot just waltz into a Puebloan reservation and have the run of the place. You will be referred to the tribal authorities, who most likely will ignore your request as a matter of course. It’s not that they are unfriendly: For them survival involves buttoning their lips, even if it involves a 450-year-old secret that just happens to be none of your beeswax.